Today, we will discover the ROT2U 6DOF robotic arm kit that will allow us to start a new series of articles. In the previous series of articles, we saw how to assemble and drive WiFI a 2-axis Pan-Tilt articulated system using Blynk, Cayenne, Node-RED and the Nodejs Johnny-Five library. I propose to attack a project a little more complex this time with a robotic arm with 6 degrees of freedom (5 axes + 1 clamp). In this first article, we will discover the kit ROT2U 6DOF found on Chinese shops for about $70. This robotic arm kit – let’s say a manipulator arm – is a very good tool to start learning programming. The movements are carried out using servomotor type MG996R having a torque of between 13 kg.cm (at 4.8V) to 15 kg.cm (at 6V). Here is a small example of what we can do with this arm once assembled and controlled using an expansion card for Arduino Uno like this one. The kit is delivered in a simple carton. The subassemblies are packaged in separate bags. The structural elements of the robotic arm are made by stamping aluminum plate. To give a better appearance and deburr the edges, the pieces are sandblasted. Black anodising (visible on the assembly instructions) has been abandoned. To my surprise, there are no instructions or any list of spare parts. For the assembly, we will have to be satisfied with a notice in image available on Sky Drive here. For assembly, you will just need a 2.5 Phillips screwdriver. Positive point of this kit, we find very easily spare parts. 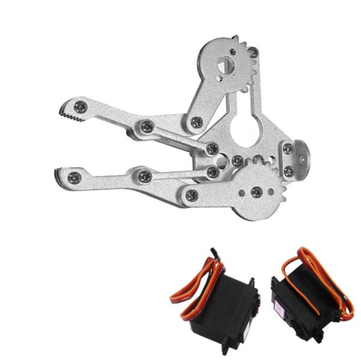 Most structural elements, servo motors MG996R, flanged base, clamp (or claw) are standard elements that are found very often in model kits or radio-controlled car. The bags are numbered on the previous picture. Turn the servo motor shaft by hand until it stops on one side. This will be the maximum position of the servo on this side. Insert the fluted support to find the correct orientation of the support plate. Attach the splined bracket to the servo output shaft with a flat-head M3 screw. Fix the servomotor using the 4 screws + nut M4x8. Insert the splined bracket and rotate the servomotor shaft to find the low position of the arm. Insert the bearing on the M3x10 screw. The shoulder should be on the side of the servo bracket. Insert the U-shaped bracket starting on the bearing side. It takes a little force to insert the servo side. Secure the servo with 4x M3x5 screws to the fluted support. Fix the bearing side with an M3 nut. Here are the steps of assembling the elbow. You can help the photos below as well. Fix the servomotor using the 4 screws + nut M4x8. Insert the splined bracket and rotate the servomotor shaft to make it stop. Put the arm and elbow vertically. Set up wrist on the elbow. Add the position of the fluted support. Open the pliers and place the last fluted support. The plane face up. Insert the servo n ° 6 into its housing. The axis is inserted into the fluted support. And now, it remains only to screw the base of the clamp on the fluted support of the wrist with 2 M3x5 screws. These are the two most difficult screws because of the lack of accessibility. Here, the arm is assembled, here are the degrees (possible movements) of freedom of the manipulator arm ROT2U 6DOF. The MG996R servomotors can rotate up to 180°. This is enough for the joints but we can be limited at the wrist and the base for example. If this is a problem for your projects, you can replace it with a 360 ° servo motor such as a JX PDI-6221MG or JX PDI-HV5932MG. In the diagram below, you can see the rotational movements available for each joint (servomotor). can you please leave the link for the next tutorial? i really loved this one and would like learn further. thanks in advance.